What can we learn about the past by studying things? How does the meaning of things, and our relationship to them, change over time? 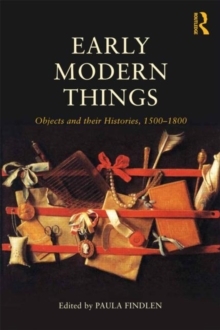 This fascinating collection taps a rich vein of recent scholarship to explore a variety of approaches to the material culture of the early modern world (c.1500-1800). Divided into six parts this book explores; the ambiguity of things, representing things, making things, empires of things, consuming things and lastly the power of things. Spanning across the early modern world, from Ming dynasty China to Georgian England, and from Ottoman Egypt to Spanish America, the authors provide a generous set of examples in how to study the circulation, use, consumption and, most fundamentally, the nature of things themselves. Drawing on a broad range of disciplinary perspectives and lavishly illustrated, Early Modern Things supplies fresh and provocative insights into how objects - ordinary and extraordinary, secular and sacred, natural and man-made - came to define some of the key developments of the early modern world. This book will be essential reading for all those interested in the early modern world.